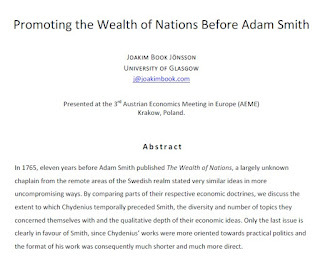 It is a truth universally acknowledged that an economics students at the University of Glasgow at some point has to discuss and research Adam Smith. Preparing for this weekend at the Austrian Economics Meeting in Europe (AEME) in Krakow, Poland, I did precisely that. 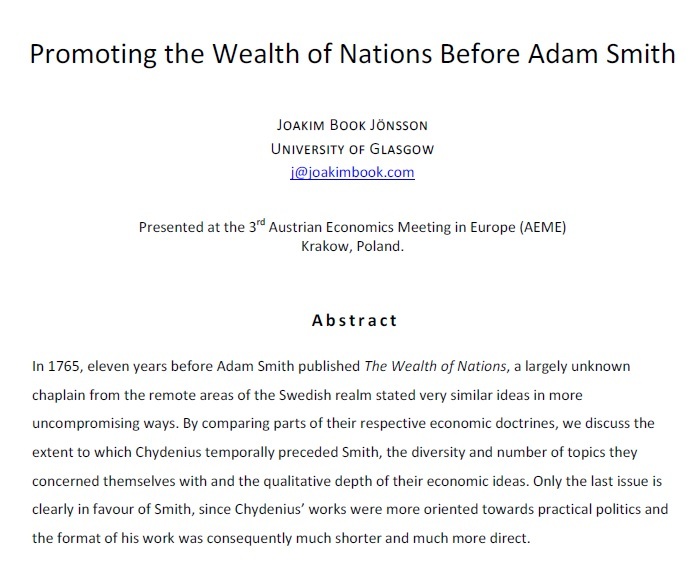 The result of this little project is available as an essay here (‘Promoting the Wealth of Nations Before Adam Smith’). The work was not as comprehensive as I would have liked, but then again the literature on Adam Smith is a black hole, an endeavour which I had neither time nor motivation to pursue. What I did instead however, was briefly comparing Adam Smith to somebody who’s been called “The father of Swedish liberalism” and the “Finnish Turgot” among other things. His work has been rather neglected, most likely explained by the fact that English translations of his work have been few and far between. A few years ago, the Anders Chydenius Foundation (in collaboration with regional association and universities) started publishing the Collected Works of Anders Chydenius, the most useful of which for an international audience is the 2012 Routledge book by Jonasson & Hyttinen (Eh.net review here), with valuable comments by Swedish economic historian Lars Magnusson: Anticipating the Wealth of Nations. So, what’s the story with this Chydenius? 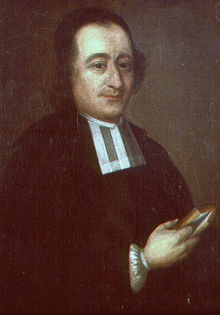 In a remote area of the mid-18th century Swedish realm, Chydenius, an ordinary chaplain in what is currently Finland spoke up against mercantilist trade regulations, taxes and censorship, was elected to parliament and advanced the ideas of Swedish liberalism perhaps more than anybody else. He has been compared to Adam Smith and A.R.J. Turgot, and his most famous work, The National Gain, preceded Smith’s An Inquiry Into the Nature and Causes of the Wealth of Nations by over a decade. Interestingly enough, from an Austrian perspective, Chydenius is given about a page in Rothbard’s remarkable Austrian Perspective on the History of Economic Thought. Rothbard mentioned his work on free trade and natural law and his opposition to the deflationary policy suggested by the Cap government, before calling him “poorly read”. (pp. 219-220). Partly applicable, considering that his only exposure to the vibrant economic ideas present on the continent during the mid-1700s, was through a number of Swedish contemporary economists discussing it. Each individual will of his own accord gravitate towards the locality and the enterprise where he will most effectively increase the national profit, provided that the laws do not prevent him from doing so. Each individual pursues his own advantage. That inclination is so natural and necessary that every society in the world is based on it (Chydenius 2012: 145, The National Gain). If one should attempt to make excessive gains, he will attract competitors who will take a share of the profit and protect citizens from arbitrary extortion. Each one must then be content with a smaller profit on each commodity and instead depend for his livelihood on turning them over all the more rapidly (Chydenius 2012: 158, The National Gain). No politician is yet in a position to state positively which industry can produce the greatest national profit for us, so that the legislator is bound to remain in quandary as to where he is to direct our workers by regulatory means. Who, some might think, is so ignorant as not to know that? (Chydenius 2012: 150, The National Gain). The kind of comparative work I tried to do has tons of scholarly problems; with the benefit of hindsight we incur some bias, believing that Chydenius foresaw Smith’s ideas, which may leads us to misrepresent his arguments; it’s also very susceptible to cherry-picking, since I read Chydenius with the words and ideas of Adam Smith in mind; lastly, it obscures Chydenius’ own motivations and reduced him to a “forerunner” of somebody else – but of course he had motivations of his own, acting and writing in his own circumstances. The aims and goals of the texts differ substantially: Smith writes in a scholarly tradition, attempting to reproduce and integrate ideas of other economic writers. Chydenius’ prime motivation was to explain the damage of regulations and trade restrictions, and see them abolished. Chydenius’ texts are thus much shorter (we’re talking pamphlet-style 30-50 pages) and the analysis is of course less comprehensive than Smith’s. As one person in the audience remarked, maybe it would be better to compare him to more politically-inclined figures in the history of ideas? Finally, Chydenius is not a substitute for Smith. If you want to understand Adam Smith and his contribution to economic thinking, there is a vast literature for you to start discovering. Chydenius may be a neat spin-off or introduction, but is hardly a replacement for the real deal. Sorry, Sven. In summary, Chydenius is a pretty interesting character and hopefully the publications of his collected works in accessible English-speaking publications will get him some well-deserved attention.